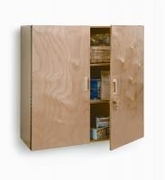 This is a fully assembled hang on the wall lockable cabinet. Includes two shelves and easy to lock set of doors. Made in the USA. 90 lbs. 36" wide x 36" high x 15" deep which is the typical size of a kitchen cabinet. Truck NH. GreenGuard certified. Made in USA. Dimensions: 15in. × 36in. × 36in.